What about Midgardhr? Our world lies at the intersection of the four pairs of worlds. It is the place where the opposites meet and blend, and where they are, in a sense, overcome.This “dialectic” of the reconciliation of opposite terms is a perennial feature of the Germanic tradition, showing up again prominently in Medieval German mysticism, and in modern German philosophy (especially Hegel). Midgardhr is the place where form and matter meet, and where spirit tries to wrest truth out of concealment. It is the place where life and death occur. In Midgardhr conscious human spirit re-forms what is according to its conception of what might be and ought to be – while all the time non-human, unconscious forces work to form the natural world. Midgardhr is the place where solve meets coagula: where the forces of expansion and contraction, or dissolution and coming-together, meet and blend. And in Midgardhr, two types of opposing change – the ordered and the disordered, sunwise and widdershins – come together and shape our beautiful but imperfect world. Now, it should be fairly obvious that what I have really done is to interpret the different “worlds” as expressions of certain features of this world. And I can easily imagine someone concluding from this that I must believe that the different worlds are mythic “projections of human consciousness.” In other words, to take one example, my position seems to be that Muspellsheimer and Niflheimr are symbolic, mythic expressions of what in fact are simply two fundamental principles governing all of existence. If this is true, then it seems as if our ancestors held those two principles in mind by, as it were, projecting them into space – hypostatizing them as “worlds,” and investing them with features that suggested their nature or function, through a kind of associational thinking: fire and ice, frosty rivers teaming with venomous serpents, etc. My answer to this objection is fairly complex. First of all, it clearly makes assumptions that underestimate our ancestors. Yes, I have attempted to offer an interpretation of their cosmology and to say what I think the nine worlds really mean. But I do not grant that I am merely superimposing some meaning of my own onto the myths. I believe that our ancestors were sophisticated thinkers who understood quite well that their myths were symbolic expressions of fundamental truths. However, they employed a type of thought that now seems quite alien to us. I have termed this type of thought “mytho-poetic” and elsewhere identified the “imaginative universal” as its fundamental feature. An example of an imaginative universal would be when a bard sings the praises of a brave man and says “He is Sigurd.” In this case, one individual, Sigurd, is taken to stand for the characteristic of being brave. An intelligible universal, on the other hand, would be “bravery”: an abstract concept abstracted from a number of examples of individuals exhibiting the same character. The mentality that thinks in terms of imaginative universals is “mytho-poetic,” and it is obvious how imaginative universals form the basis both of myth and poetry. This mentality seems quite strange and foreign to us moderns, as we are accustomed to dealing almost exclusively with intelligible, abstract universals. It is almost irresistible for us to assume that our ancestors, in making myth or poetry, began with some intelligible universal – in other words, an abstract concept – and then found some “symbolic” or sensuous way to express it. This is, in fact, the procedure a poet or fiction writer might follow today. They begin with an idea, then seek some “poetic” or allegorical way to express it. But I think it is an anachronism to read this procedure back into what our ancestors were doing, and it is a fundamental misunderstanding of the mytho-poetic mind. In fact, I am suggesting that our ancestors literally thought in terms of imaginative universals. They grasped what we would call “ideas” in the form of images, myths, and symbols. In other words, they did not begin with abstract ideas and then dress them up in poetic garb. No, they began with poetry, which was their way of expressing and understanding the nature of the world around them. In “The Fourfold” I discussed Heidegger’s view that poetry is the “primal form of building” and the “original admission of dwelling.” Poetry (and, by extension, myth) is the primal form in which human beings say what is. Poetry was our ancestors’ way of expressing fundamental truths. Further, as everyone knows, poetry has its origin in intuitive, pre-reflective inspiration. The implications of all of this are fascinating, for it suggests that the myths of our ancestors were an expression of genuine insights that were intuitive and non-rational. In fact, my conviction that this is the case is what guides all of my writing and thinking about the Germanic tradition. I write commentaries on the myths and traditions of our ancestors because I believe that they possessed a special access to truth – and that we have to work to recover that truth, and their mode of access to it (it is the latter thing, though, that is the most difficult). Thus, when my imaginary objector tells me that “Our ancestors believed that there really was a Muspellsheimr; that it was an actual place,” I must respond yes and no. Muspellsheimr was their way of grasping a certain fundamental feature of reality. But does Muspellsheimr actually exist? Yes – insofar as that fundamental feature of reality exists. Does this mean that if we travel far enough north we will run into an area of icy, venom-filled rivers teaming with serpents? No. But to think of Muspellsheimr merely as a physical place with certain features is to completely fail to grasp its meaning, and to underestimate our ancestors. But, as I noted earlier in this essay, the result is not a consistent or “logical” cosmology. The Germanic cosmology, taken as a literal account of multiple worlds, is rife with contradictions and inconsistencies of all kind. It is as if our ancestors, when “projecting” these worlds, gave little or no thought at all to making their mythic accounts self-consistent and logical. I think that this is exactly right. What really mattered to them, I believe, was the descriptive and explanatory power of the principles expressed in mythic form. But there was no requirement that the details of these mythic forms be consistent or logical – or even concretizable or visualizable. This is another, basic feature of the mytho-poetic mind – a feature we find very hard to understand. No doubt had she responded this way, Burns’s love would have faded rapidly (well before the seas gang dry). But the response of the obtuse lass is identical to the modern mindset that fails to understand the mythic and dismisses it as “primitive.” Love really is like a red, red rose and a melody sweetly played in tune. And it is like neither. It is one of the profoundest mysteries of life, none of which can be adequately encapsulated in a logos: in a definition or a formula. The only possible approach to the truth about these things is through the iteration of multiple ways of “talking around” the subject: through multiple metaphors, similes, parables, images, symbols, etc. No one of these is “the truth,” but all approach the truth. These approaches may even conflict with each other, and can never be fully harmonized or made consistent. But that is just fine: each has its limits, each complements the others. The approach of mytho-poetic thought is thus, in a peculiar sort of way, dialectical. In other words, it uses apparent contradiction as a means to get to truth. In a single mythological tradition one will often find differing, conflicting myths accounting for or illuminating the same phenomenon. Sometimes this has to do with the simple fact that a single mythological tradition develops in divergent ways in different geographic regions. But what is incredibly hard for our modern minds to grasp is that the people in question did not regard the conflicts between myths as problematic: these were simply different ways of illuminating one truth. The details of the different myths in a single mythological tradition are indeed often very different – but there is no fundamental conflict between these myths, in terms of their deep content. Consider also the many attempts that have been made to create visual depictions of Yggdrasil and the nine worlds. Many of these are quite intricate and attempt to locate all the different worlds, the roots of Yggdrasil, the different wells and rivers, and so forth, in one “coherent” visual summation. All these attempts fail. How could they succeed, given all the aforementioned, impossible-to-visualize inconsistencies? By far the most successful “rationalization” of the nine worlds is the diagram published by Edred Thorsson for the first time in Runelore (1987), which identifies the nine worlds (and the paths between them) with the structure of Yggdrasil itself. The diagram is clearly inspired by the Kabbalistic “tree of life” (and has been criticized for this reason), but it is an extremely valuable aid in achieving an esoteric understanding of Yggdrasil and the nine worlds. However, Thorsson would be the first to admit that – like any diagram – it has its limitations, and omits much. No diagram can fully and adequately rationalize the Germanic cosmology. And the attempt to get at an understanding of that cosmology through diagrams and rationalized schemas is fundamentally problematic for the simple reason that it attempts to get at the world of our ancestors from without. We moderns are accustomed to thinking of our world in this way. However, as I have said repeatedly, we can only understand the worldview of our ancestors from within. But since the mythic form in which that worldview was cast is so alien to us and so fraught with problems, the only way to understand it from within is to try to identify the deeper meanings expressed in those myths and to try to see the world in terms of those meanings. This is all I have attempted in this essay. A major problem remains: even if we are able to understand in theory what the mytho-poetic mentality is like, this doesn’t mean we can enter back into it. We have been south and have not found Muspellsheimr, nor have we found giants in the east, or dwarfs in a world beneath us. I have no solution to the problem of how to recover the mytho-poetic mind. Perhaps the right approach is to try, deliberately, to read the world as an emblem book: to see things as symbols, to deliberately try to see the world as a poet would. But all I can do right now is to try to recover the “inner meaning” of the myths and to express it in terms of abstract universals. Our ancestors’ way of understanding how the world works, and what its principal aspects are, is quite different from ours. If we can begin to think of the world in terms of those aspects again – even if they are only expressed as abstract ideas – then that is at least some progress in seeing and feeling the world as my ancestors did. Really, I have already offered an answer to it in my essay “Summoning the Gods,” where I discussed the phenomenon of personifying the gods. 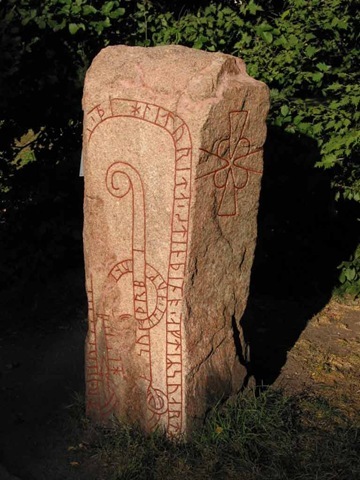 See my essay “What is a Rune?” The concept of the imaginative universal originates with the Italian philosopher Giambattista Vico. Hence the ancient Platonic conflict between the poets and the philosophers. And where did these insights come from? From something that clearly transcends the human. It is fundamentally problematic to speak of a single “Germanic cosmology.” Instead, what has come down to us through Snorri is an attempt to synthesize a number of cosmologies in which the details are different. The inconsistencies within Snorri reflect this (as do the inconsistencies, for example, between Snorri and the Poetic Edda). There is a second “Earth” (Jördhin again) mentioned just after the account of Thor’s parentage. However, she is the daughter of Night and a man named Annar. See Prose Edda, p. 37. I can imagine someone believing that this worldview has been superseded (or even refuted) by modern science. But this is not the case: in fact there is no incompatibility between this system and modern science. To take one example, I have argued that Vanaheimr represents all positive, regular, or orderly change in nature, such as the change of seasons and the cycles of fertility. That human beings do experience an element of “order” in nature, contrasted with the chaotic disorder represented by Jötunheimr, is undeniable. When we wish to know, however, the physical mechanisms that make possible the cycles of fertility (such as hormonal changes) science provides us with answers. And when we wish to know specifically why those cycles are off kilter in an individual or a population, again we turn to science. Science does not banish the gods, the dwarfs, or any other “mythic” beings: it reveals to us the physical means through which the gods, et al., operate.